Monday 19th November was a night when rain almost stopped play, at least for me. I’ve seldom been as cold and wet when taking pictures. 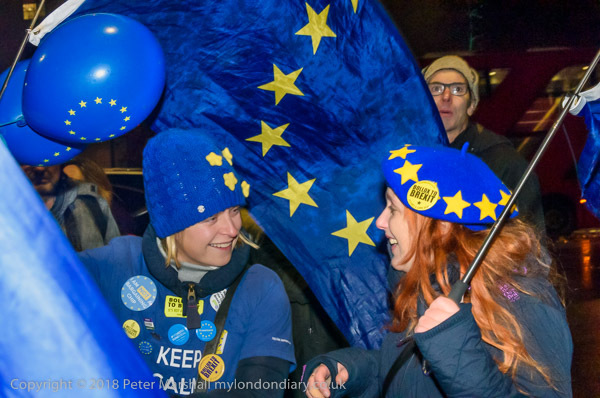 Although rain had been forecast it came earlier than expected and was heavier as I stood with a small group of protesters on a poorly lit central London street. 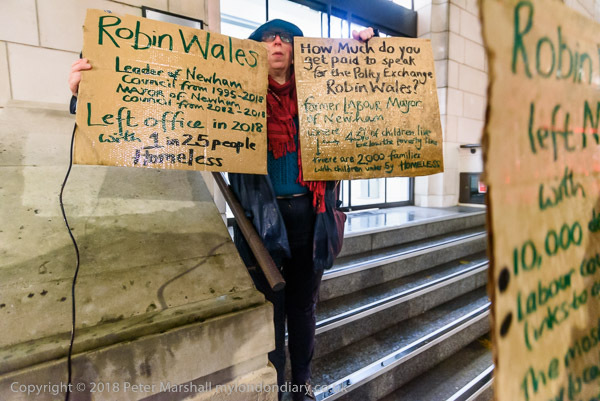 We were outside an office building which houses the centre-right think tank Policy Exchange where former Newham Mayor Sir Robin Wales now works and was speaking at a housing conference. 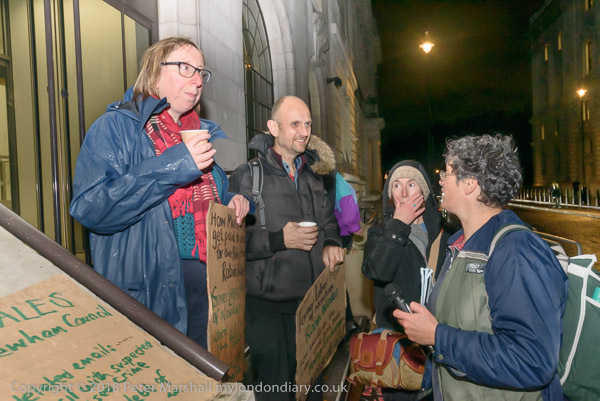 I was with half a dozen supporters of Focus E15, the Newham-based housing protest group which waged a long battle with the Mayor and his housing policies. What began with his decision to stop supporting a hostel for single mothers and children, forcing the housing association to give them notice of eviction, when they decided to stand together and fight to get themselves rehoused in London rather than dispersed to far-flung areas of the country in private lettings later turned into a much more widespread campaign for an end to social cleansing and decent treatment for those in social housing and others needing it. Their fight gained national attention, newpaper articles were written about it, plays were written around it and the young women who led it invited to speak at conferences. The campaign continues, though now with a new Mayor in place and some slight changes in council policy, with its street stall every week in the centre of Stratford, a small community centre for meetings, films etc and occasional protests such as this, along with support for those with housing problems or threatened, as they were, with eviction. As the pictures show, the protesters looked pretty bedraggled, and like them I was getting wet and cold. For once I put up my umbrella for some of the time while taking pictures, though it really needs a third hand. Though I now rely on autofocus almost all of the time, altering the focal length using the zoom ring really does need two hands and perhaps my framing was a little less good than usual. Because I was able to work close to the protesters, I didn’t feel any need to use a longer lens than the 18-35mm which I had on the D750, and all the pictures were taken with this. It’s also a lot easier to keep one camera dry than two. AL pictures were taken at ISO 6400. It really was too dark to work without extra lighting, mainly supplied by using my cheap LED light, a 216 LED Neewer unit. It seems to now have a rather lower light output than it should and the AA batteries seem to lose power very fast. I’m wondering whether it just needs a better set of batteries or I should look at a more expensive replacement unit. It’s more flexible than the flash in that I hold it in one hand (on this occasion I had to put the umbrella down to do so) and so have some limited control over the light direction. Flash was more convenient as the Nikon SB800 fits into the hot shoe and I could keep the umbrella up. But it isn’t a great idea to use flash in the rain as it is at its most powerful on raindrops falling close to the camera, and some frames were unusable. About half the pictures were made using the LED and the rest with flash. The people in the office took pity on us, and a man came out with a tray of hot tea, though a couple of the protesters refused on principle to accept any gifts from them, but I found it very welcome. 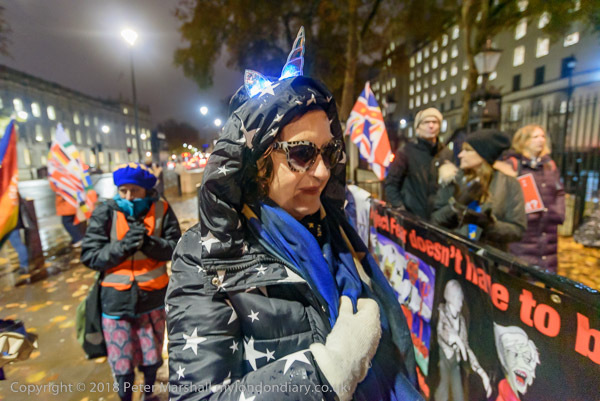 As I left the protesters and made my way the short distance to Downing St the rain eased off, and photographing the Stop Brexit protest there was considerably more pleasant. There was also rather more light, and I was able to take some pictures without any additional lighting uysing the D810. 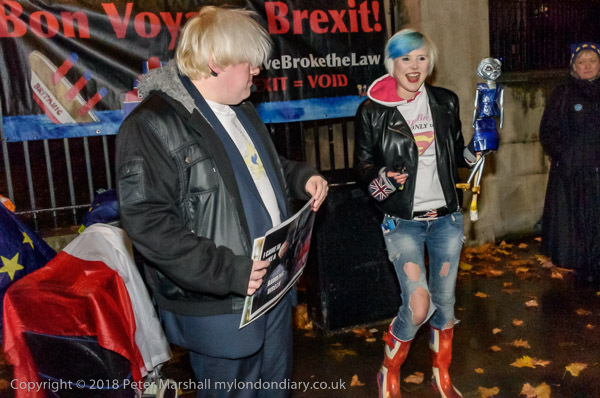 For the staged performance by Boris impersonator Drew Galdron and EU Supergirl Madelina Kay and a three person chorus, I mainly worked without flash, though subject movement and slow shutter speeds meant rather many were too blurred. I did make just a few exposures with flash to be sure of getting a sharp image, but felt a lot of flashing would have been rather annoying for both audience and performers. The performance came to an abrupt end when we were told that people were about to leave Downing St after partying about Brexit with Theresa May, and everyone rushed across to protest. It was rather darker in front of the gates, so nearly all the pictures I made there were taken with flash as I rather liked the way it isolated the EU flags and berets against a darker background. This entry was posted on Sunday, January 20th, 2019 at 09:36 am and is filed under My Own Work, Photo Issues, Political Issues. You can follow any responses to this entry through the RSS 2.0 feed. You can leave a response, or trackback from your own site.